Clematis 'Alionushka' is a semi-herbaceous variety with non-clinging stems that produces masses of small, nodding pink fleshy flowers with a darker stripe on each petal from July to September. This non-evergreen plant can be grown against a trellis, garden fence, wall, arches, pillars, pergolas, clambering over tree stumps and through large shrubs in the border with adequate support. 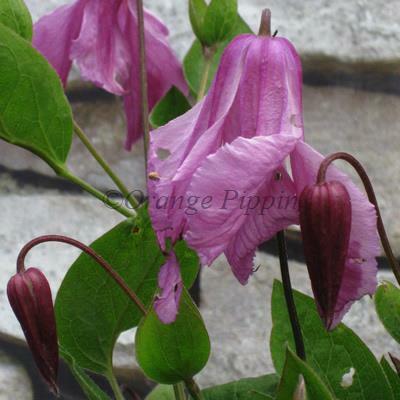 Clematis 'Alionushka' was raised by A.N. Volosenko-Valenis and M.A. Beskaravainaja of the State Nikitsky Botanic Gardens, Ukraine.